Pedestrian safety is a top priority in school zones and on school campuses everywhere. With 20% of the 55 million school children walking or biking to school, reducing driver speed in school zones is more critical than ever. While there are many causes for traffic accidents, driver speed is cited as the root source of 33% of all traffic fatalities. 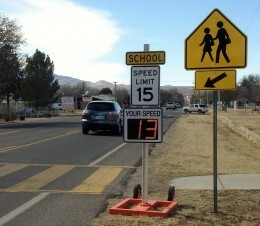 Radarsign offers several options that provide traffic calming in school zones. Hyper-Alerts™ are compact clusters of LED lights built right into the “Your Speed” faceplate of the TC-600 model delivering the same luminescence as a 12″ beacon, only in a more compact surface. This results in an “impossible to ignore alert” even over 1000 feet from the sign. This system includes flashing beacons, an AC powered or solar powered radar speed sign with a yellow/green fluorescent YOUR SPEED faceplate, and StreetSmart traffic data reporting software. This system includes stand-alone flashing beacons. Optional add-ons include a timer, regulatory school zone sign, pole and footings. Solar powered, AC powered, and battery powered models in 11”, 13” and 17” LED sizes. Additionally, our Mobile Patrol Stand and Radar on the Go speed trailer hitch provide an easy way to add mobility to your traffic calming efforts. Is Your School Zone Safe? 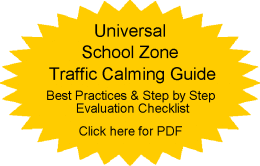 As America’s School Zone Safety Partner, Radarsign has published a best practices and step-by-step evaluation checklist so you can determine how safe your school zone is. Federal grant funding is available for elementary and middle schools through the Safe Routes to School Program (SRTS) for roadway safety measures which include traffic calming devices such as a radar speed sign. Radarsign models are eligible for 100% funding as an infrastructure improvement.